Please note: this posting will be updated as more information is found. 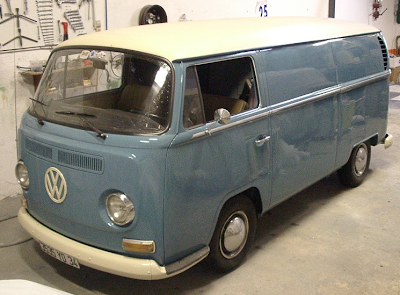 On May 9th, 1968 (a Thursday), as the revolution was starting in France, a Neptune Blue VW Delivery (Panel) bus rolled off the lines in Hanover, Germany. It came with Dark Blue Leatherette interior, a manual transmission and a 1600cc, 47 HP engine. It would have rolled off the line right around the time the two-millionth Type 2 Volkswagen bus was produced. The bus was then shipped to the USA through the port in either San Francisco or San Diego (no one seems sure of this code). Over 40 years later, on September 5th, 2007 (a Wednesday), Brett and Elizabeth purchased that same bus, now with some modifications. On July 13th 1968 (a Saturday), 4 days before Saddam Hussein would come into power in Iraq, the bus was sold to M. Edwin Riddle of 927 Grove Way, Hayward, California. It would have been around $2,295. 0-60 mph took about 37 seconds and top speed was 65 mph. VW calculated fuel consumption with the vehicle traveling at 75 percent of top speed, which worked out to 23 mpg at 53 mph (we have average 18 mpg). The bus had been on the lot at Humphrey Motors, Inc - a Volkswagen dealership at 750 A Street, Hayward, California. The salesman's name was Tom Berberich. 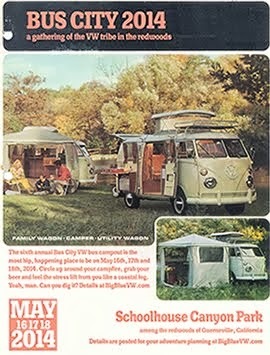 At some point in the next 23 months, police would clash with antiwar protesters in Chicago, Illinois, U.S. spacecraft Apollo 8 would enter orbit around the Moon and Riddle would upgarde the VW panel truck with a new camper interior, including a bed, 12 volt fridge, and windows with screens, installed by California Road Runner Camper of 2000 Laguna Street, Concord, California. This is when the spare tire was added to the front of the bus. I know of at least 3 other conversions by the same company, which was done to a 1966 and 1968, so I have no idea how long that company lasted beyond those years. On June 23rd, 1970 (a Sunday), a day before the United States Senate would repeal the Gulf of Tonkin Resolution, Monty Finefrock, of 12708 Border Hill Road, Los Altos, California, purchased the VW from Wes Behel Volkswagen at 1025 E. El Camino Real, Sunnyvale, California. The salesman was Dan Larsen. The price including tax was $3074.25. He traded in a '66 Mustang and they threw in a spare tire. For the next 37 years the bus would be Monty's. 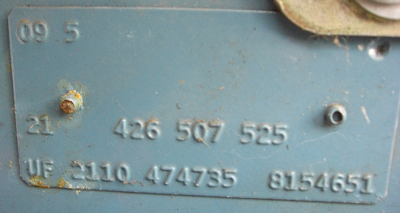 Monty would change the plates from "WKT398" to "Big Blu 3". He would add a oil temp gauge, a rpm gauge and an oil pressure gauge. He would also add a ASI Riviera poptop on 7-4-1981 at 9829 Bigge Avenue in Oakland, California. Around November of 2006, it came to rest in a storage spot in Redwood City, California. After sitting awhile, Monty, who had now moved out of the Bay Area, listed it for sale on Craigslist.org, where we would see it and buy it. It would be our wedding gift from a few people. 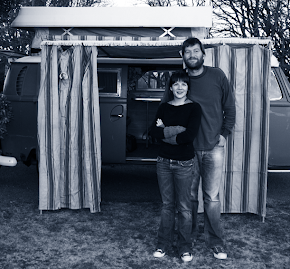 We created an online registry where friends and family could buy parts of a VW bus for us. After our wedding on July 7th, 2007, we were on the VW hunt. 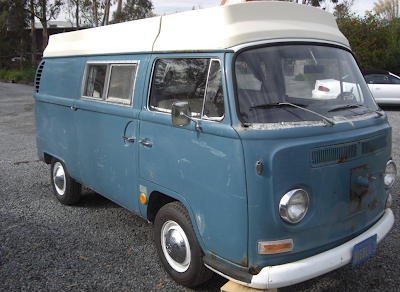 The Friday of Labor Day weekend, on our way to Yosemite, we drove down to Redwood City to look at the bus we had seen on Craigslist and we fell in love. The above bus in not Big Blue, but minus the chrome trim on the side, this is how he would have looked coming off the assembly line. The first thing we did was create this blog to not only track its history moving forward, but its past as well. The second thing we did was give Big Blue some new wheels and tires. The third thing, was trailer him to Paul of Valley Wagonworks in San Rafael, California and have him go over the entire thing. Big Blue offers Elizabeth and me a chance to explore both nature and the nature of an old car. When we fix something, which we will do often, it is an opportunity to both learn and be the direct recipient of that learning. We look forward to many happy miles in Big Blue. Given that BigBlue was first sold at a dealership in the Bay Area, I'm willing to bet that "UF" stands for San Francisco, and not San Diego. 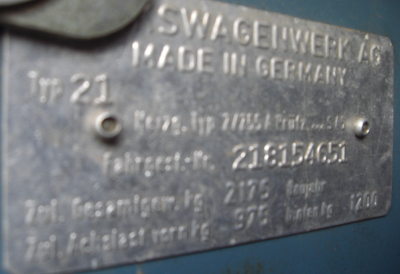 Which also solves a little mystery pertaining to our Ludwig--he's also a UF. Nice research! I wish I could do as well. Any hints? Honestly, it was a good previous owner. Monty had stacks of paperwork and the original sales material was still in the glovebox. He actually kept all of his gas mileage records in small notebooks which I have. I have every mile recorded until at least the mid-1980s. Once Monty knew I was into the research, he sent an email out to all his old friends trying to get their memories of the trips they took (which will be coming I hope). He also dug up his original bill of sale and sent it to me. He is sending pictures of it through the years when he gets his stuff unpacked. That's great that you're able to piece so much of Big Blue's history together. I wish Lottie's POs had been so kind as to leave me treasure map of reciepts, as yours did. Great blog, btw. I think it's definitely going to be a role model for my fledgling site.